No – this does not mean I am more than a fan of farting. Although they are usually funny. Eons ago, I used to do electrical work. In a bathroom, the exhaust fan is referred to as a “fart fan” by sparkies because of its obvious purpose. Every bathroom has them (or should). I had one in my house that was making some weird noises (sounded like a burned out bearing) so yesterday, I replaced it. However, I did not throw the old one out – I cleaned it out and fixed it, and figured out a great use for it. The Beast is a great BBQ despite how ugly she is, but it does have some air-flow inconsistencies, especially after I added some new stuff inside it. I would always address this previously by dropping flaming paper down the chimney – it would usually pull the air back up and thru that way. Once primed right, it would cruise. But I might need to do that once an hour or so – which was a big pain, and it made it hard to gauge the cooking time which became kind of inconsistent. So I cut the cord off an old saw that was otherwise useless, and hardwired it into the old fart fan, so it has a plug. 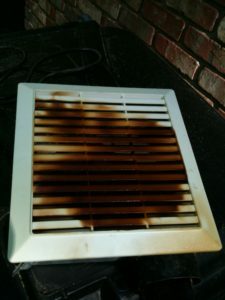 I ran an extension cord (which my wife hates me for), and put that fan on top of the chimney and fired it up – the result, was incredible air flow control…it worked perfectly. I have 2 picnic shoulder cuts on there right now, easing their way into delicious over the course of this afternoon….but this new way to control the air in there is going to make it much easier for me to master, and get exactly where I want it to be. 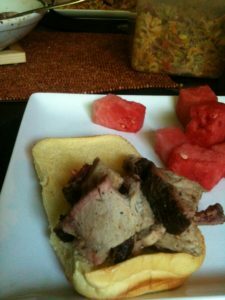 Or so I think – we’ll see what the pork shoulders come out like. Chopped pork is on the menu tonight, so I have a lot riding on it. Probably more faith than anyone has ever put into a fart fan before. OK – it is the next day, and I couldn’t have been more pleased with the way that thing worked. I had intended to only use it occasionally, to recreate the natural draw. But once it started going, I decided to simply let it go, and see what happened. The steady draw was great for the fire, and great for the meat. It created enough draw to pull the top down tighter – so pulling it up when it was cooking was actually effort – that has never been before. 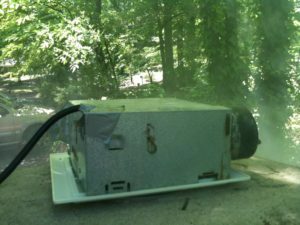 But I loved it – the fan was like a car exhaust or industrial smokestack, just steady. Smelled better than a paper mill though! Here’s a minute or two video clip of it working. 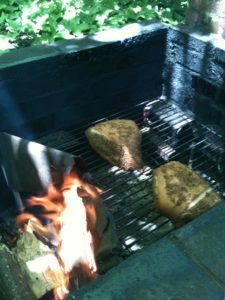 I was able to leave it alone the whole time, and simply stirred coals, and added more hickory to them a couple times. I cooked it like that for 4 hours – bringing internal temps in the shoulders to 165-170. I took ’em off, wrapped them in foil and put them in the microwave, to rest – usually, I use a little cooler for that, but was too lazy to go to the basement to get it. After about 30 minutes of letting them sit in their own juices, I carved them up. Shoulders aren’t as good for BBQ as butts, in that they are simply tougher, more fatty…and these were kind of cheap, as far as that goes. 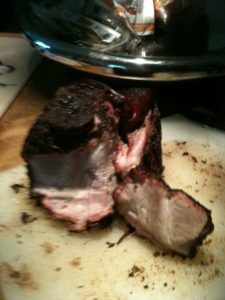 But the flavor was PHENOMENAL – check out that smoke ring, it goes in almost a half inch in places. The marrow in the bones was delicious too – but only I ate that, while I was messing with carving it. I chopped it all up, put it in a big bowl and made a vinegary BBQ sauce for it (on the side, of course). Had these little soft potato rolls, so it was heavenly. My friend Lee should be drooling right about now, wishing they had BBQ like this in Prague. By the end of it all, the fart fan was a champ and a half – made it super easy to use the Beast more efficiently. I am the fart fan’s biggest fan.